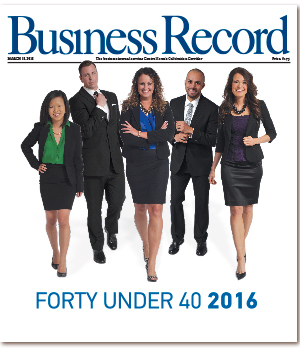 The Business Record is proud to announce the 17th annual list of Forty Under 40 honorees. Together, they join 640 past Business Record Forty Under 40 honorees to bring the total number of honorees to 680 since the Business Record began the awards in 2000. Each of the honorees will be profiled in the March 18 edition of the Business Record and recognized at an event on March 30. Congratulations to all of this year's honorees! Mike Barratt - Charles Schwab Corp.
Josh Braby - Neumann Brothers Inc.
Nola Cartmill - Belin McCormick P.C. Alex Duong - Mediacom Communications Corp.
Josh Ehlen - Reynolds and Reynolds Inc.
Noreen Otto - Hy-Vee Inc.
Susan Rathjen - Bankers Trust Co.
Jennifer Smith - McGowen, Hurst, Clark & Smith P.C. Emily Toribio - Fareway Stores Inc.